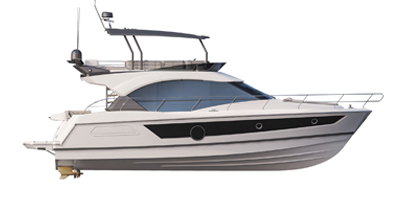 the Antares 21 contemporary yet timelessly stylish. It is easy to organize a day outing off the top of your head with the Antares 21. With a length of 24'6'' and beam of 8'4'', she can be transported by road. The modular bench seat creates an additional double berth, so you can welcome 4 people on board the Antares 21 for an overnight trip. Suiting all tastes and situations, the cockpit’s aft bench unfolds into a large sunbathing area. The Antares 21 has an amazing level of equipment for a boat of its category: lots of storage, small fitted galley area. Electric windlass available on option to make dropping anchor easier. Single outboard engine - maximum power 175 HP - Mercury engine. Small galley: sink, with manual pump, place for hob, worktop, 12 US Gallon refrigerator (option).